I’ve been guest blogging and Q&A Interviewing my heart out since March 2011 in an effort to become a known author. Last summer I stumbled upon a post on a site called Author Roast & Toast and was totally charmed. I sent an email asking if they had openings and arranged a date for the new year. That day is today! Fun-loving women and authors of note, Sharon Donovan, Mary Ricksen, P L Parker and Hywela Lyn throw a weekly party for a guest author on Fridays. And fun people they are, they search for images of party foods and drinks that their virtual houseboy Oliver cooks up and serves. The book and author of the week are showcased within a fun dinner party or luncheon atmosphere. I read their intro for me and smiled, several times I laughed out loud. I’m there right now answering any questions or responding to comments. Leave a comment for a chance to win ebook copy of Dreamscape too. Come see! quite possibly another Sunday Snog! This entry was posted in Past Posts - you'll never know what you'll find and tagged Author Roast & Toast, authors, books, promotion, reading, Romance. Bookmark the permalink. 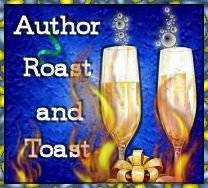 1 Response to Fun happening ~ The Author Roast & Toast! I’ll head over there next. Your blog is beautiful, Rose. I look forward to visiting often.